Can a Diet Rich in Antioxidants Help Prevent Skin Cancer? There is increasing evidence that foods that are high in antioxidants can help prevent these types of cancers. Skin cancers are the most common form of cancer in America, with more cases presenting than breast, lung, prostate, and colon cancer combined. By now, you’re probably well aware of the tried-and-true trifecta when it comes to preventing skin cancer: stay out of the sun, use plenty of sunscreen, and wear protective clothing. 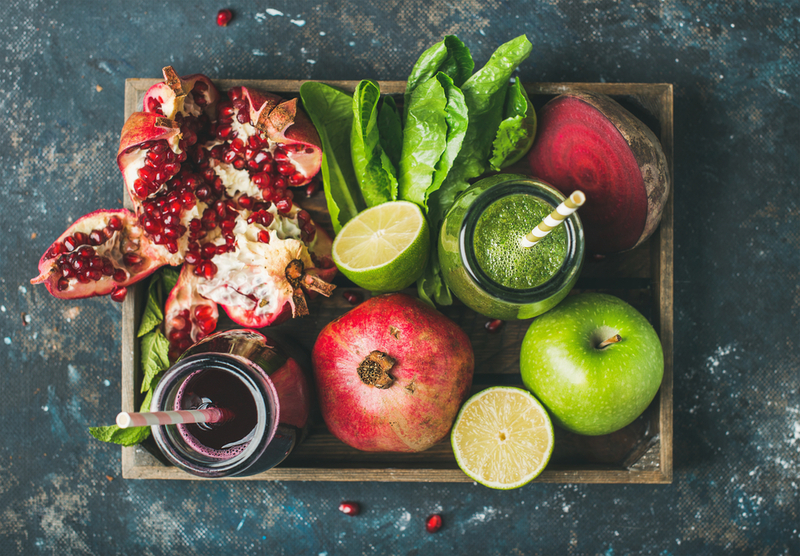 It may go without saying that regular checkups and skincare protection are part of prevention and early detection, but did you know that your diet can play a role, too? It’s true: There is increasing evidence that foods that are high in antioxidants can help prevent these types of cancers. How exactly do antioxidants help prevent skin cancer? It’s a complex process. We’ll provide a quick rundown of how it works, followed by some specific suggestions for how to add more high-antioxidant foods into your diet. Skin cancer typically occurs when there are changes in skin cells due to exposure to ultraviolet (UV) rays, whether from the sun (which causes over 85% of all skin cancers) or tanning beds. There are two main types of skin cancer: nonmelanoma and melanoma. Nonmelanoma skin cancers (NMSCs) are the most common, with well over three million Americans treated for them every year. These cancers grow and damage nearby tissue, although they won’t usually metastasize — or, spread elsewhere in the body. Though melanoma skin cancers are far less common, they’re much more dangerous than NMSCs. They involve color-creating melanocyte cells that grow, destroy nearby tissue, and can metastasize elsewhere in the body. These are the skin cancers that appear as moles that grow or change. Despite differences between the two types of skin cancer, a diet high in antioxidants seems to help prevent both. Antioxidants are compounds found in food (and elsewhere!) that prevent the damage to DNA that can be caused by UV rays. There are many forms of “oxidants” that can damage DNA — like cigarette smoke or exhaust smoke — and as you may suspect from their name, antioxidants combat those. Some common antioxidants you might have heard of include vitamins C and D, omega-3 fatty acids, and zinc. There are plenty of others, like lycopene and beta-carotene, which are just as powerful, if not as familiar. Certain foods have exceptionally high levels of antioxidants — these are the “superfoods” you’ve probably heard about. While you can get some antioxidants from supplements or pills, one major benefit of superfoods is that they’re whole foods, rather than just an extract or isolation of a food. This is important because studies show that foods containing antioxidants are most effective consumed whole so that their various components can work together for compounded benefits. So antioxidants are good, especially when consumed as whole foods, but which foods are the highest in them? One of the most well-known high-antioxidant foods is blueberries. In fact, these little berries contain the highest antioxidant levels out of any regularly consumed fruit. Other berries contain powerful antioxidants as well, and their health benefits extend beyond potential skin cancer prevention: these tiny powerhouses are also good for your heart and brain function. With their high vitamin C content, citrus fruits offer an excellent way to get some antioxidants. Studies suggest that they have an impact when consumed in large amounts, so stop holding back on that box of clementines and get to peeling! Spinach is trendy for good reason: it’s delicious, versatile, and ridiculously healthy. It contains multiple antioxidants, including lutein and beta-carotene. Don’t stop at spinach, though — kale, beet leaves, and collard greens are excellent choices, too. If you’re a snacker, you’ll be glad to know many nuts and seeds contain a hefty dose of antioxidants. Pecans and almonds are some of the highest ranking in this category due to their high Vitamin E content, but there are plenty more nut options if you don’t like the taste of those two. Fresh herbs pack a wallop when it comes to both flavor and antioxidants; some studies show just one tablespoon can contain as much as one piece of fruit. So pass on the salt and cut up some parsley, rosemary, basil, or sage, because these four are the heaviest hitters. If you’d rather drink your antioxidants, you’re in luck. Wine and tea are both high in these cancer-fighting compounds — but remember, everything in moderation! For wine, a glass a day is still the recommended limit for women (it’s two for men), and that’s enough to reap the health benefits. As for tea, both black and green varieties seem to inhibit the development of cancer, so think about adding a cup into your morning or afternoon routine. Just remember not to drink caffeine too late in the day to avoid disrupting your sleep that evening. Last but most certainly not least, we have chocolate. If you thought learning about antioxidant-rich foods was going to be all work and no play, you’re off the hook here. We’re not talking milk chocolate, though — it’s dark chocolate with a high cocoa content that contains the helpful antioxidants. You can find foods that are high in antioxidants at your local grocery store, and the good news is that plenty of them are inexpensive. Make a list of antioxidant-rich ingredients and peruse the aisles with list in hand so you can identify smart choices while at the store. Play around with some of your favorite recipes and see if you can throw more antioxidant-rich foods in the mix. If you already love smoothies, try using fruits, seeds, or even vegetables with high antioxidant levels. If you’re a pasta fan, try pairing a pasta dish with things like olive oil — which is high in Vitamin E — and kale. Don’t underestimate the fun to be had experimenting with new-to-you recipes in order to sample all of these antioxidant superstars. Don’t know what to do with kale? Try it in a salad, soup, or baked into chips as a snack. Never used rosemary beyond stuffing a chicken? It’s great in savory shortbreads or crackers, in dips, or in soups. The recipes using greens in unique ways are endless. Now’s the time to branch out and try spanakopita (spinach and feta pie) or Southern collards. There are countless ways to incorporate antioxidant-rich foods into your diet to reap the rewards, so why not have fun and learn something new while you’re at it? What Else Can You Do to Protect Your Skin? A diet high in antioxidants is only one small part of your arsenal against skin cancer. Don’t forget to monitor your sun exposure — try to avoid the sun during peak hours, and use sunscreen if you’re going to be outside for extended periods of time. You should also get familiar with your skin. Make a note of freckles, moles, or any spots you see. That way, if there are any changes, you can catch them early on and reduce the risk posed by any potential skin cancer. This works best in conjunction with an annual skin cancer screening by your doctor. If you have any questions about skin cancer prevention or adjusting your diet, always make an appointment with your doctor or nutritionist to get those answered before moving forward. Good luck experimenting with incorporating antioxidants into your diet!